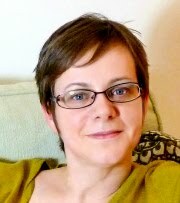 First things first...you might have noticed that my blogspot address has now converted to Honeycatcookies.co.uk. Everything else should stay the same, and you should still be able to find me even if you use the old address. 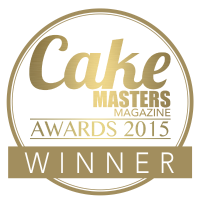 Sadly any comments made through Google+ until now will have disappeared, though I saved all the wonderful comments full of brilliant cookie ideas on my giveaway post! So onto these cookies! It's been so drab and cold here, without even the pleasure of snow or proper frost. Boring, wet, annoying, GREY weather. 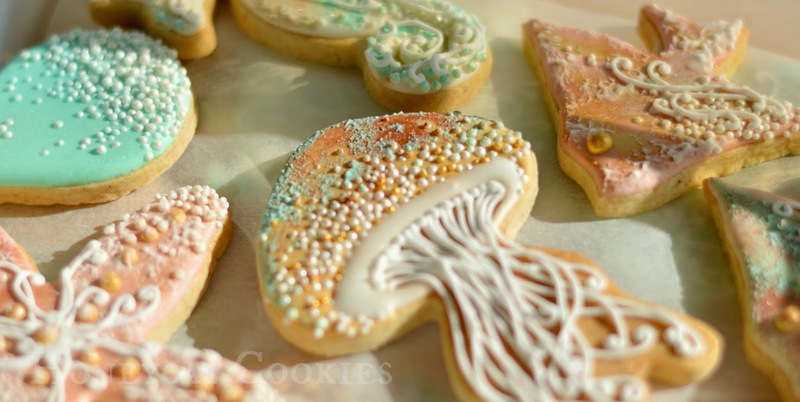 So when I was asked to make this set of seaside cookies, my head became filled with sunbleached images of sand, driftwood, rockpools, sand, sealife, sand, those faded, flaky layers of paint and rusty metal on abandoned boats and sand. I wanted to create something with all these textures and colours and lighten up my life just a little! 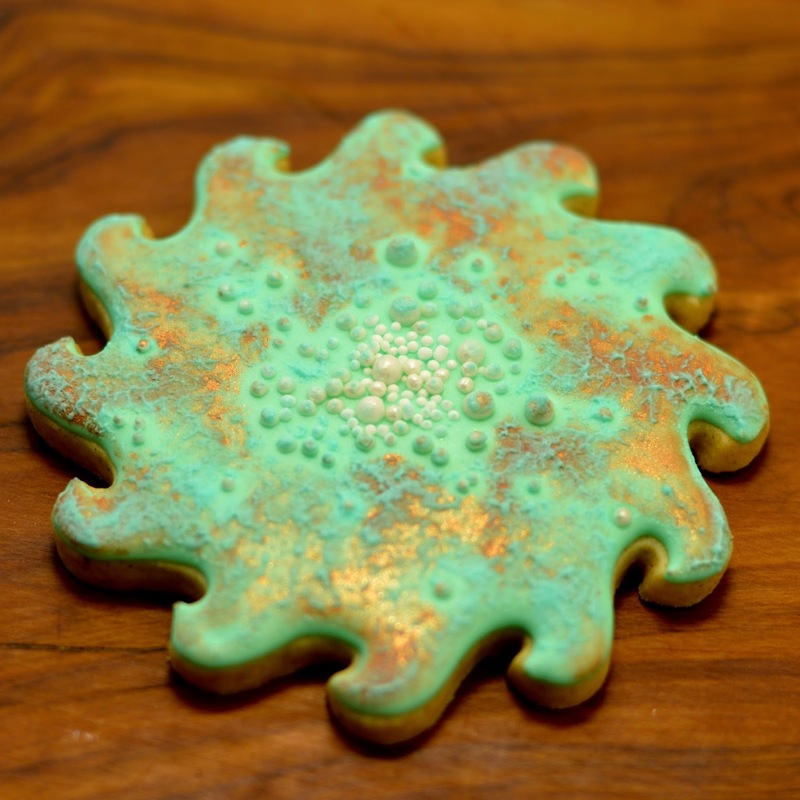 And then I read LilaLoa's tutorial on Antique Metal Cookies which turned my thoughts to creating that flaky, verdigris paint effect that I'd been mulling on, using a similar technique, but in all those wonderful seaside colours. A damp cloth, to keep wiping your mucky fingers on. 1. 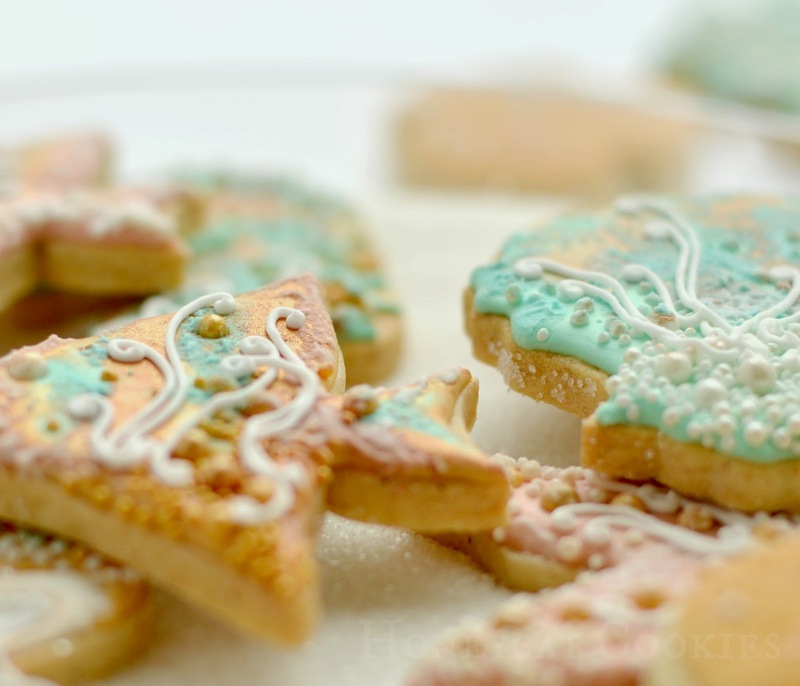 Start by mixing your RI into a light bluey green colour and flooding the bases of your cookies leaving enough icing for extra to dab on top afterwards. Allow the bases to dry thoroughly for a few hours in a dehydrator or overnight. 2. Tap out a little of the dry lustre dust into a small container or dish. 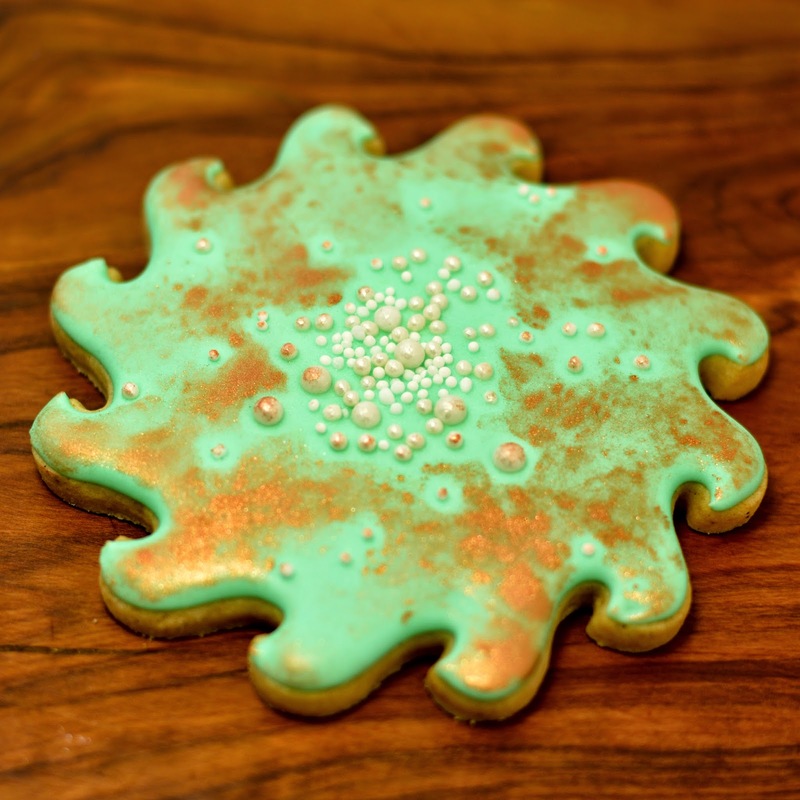 Dab your finger into the dust and dab irregularly in patches on the dry surface of the cookie. Don't rub it around or cover too much of the cookie. It needs to look rough edged and uneven. Blow off any excess. 3. Now mix up the remaining RI with a little more blue so that now it's a light greeny blue, rather than bluey green. Just go far enough that you can definitely see a difference between the two shades, but keep them close. Using your (now clean!) finger, dab just a little RI at a time around the edges of the patches of lustre dust. Some will mix with the dust and change colour. Keep going, but leave some base RI areas and lustre dust areas clear, so that the whole effect is patchy and flaky. (Keep cleaning your finger on the damp cloth or it'll build up and you'll be tempted to lick your finger. This isn't nice, don't do it! You can always get a spoon and eat the leftovers but finish your work first.) After a minute or two, you can dab over older areas to make it look more crusty and flaky. 4. You can of course just leave the effect as it is, or you can go further and add layers of detailing on top. 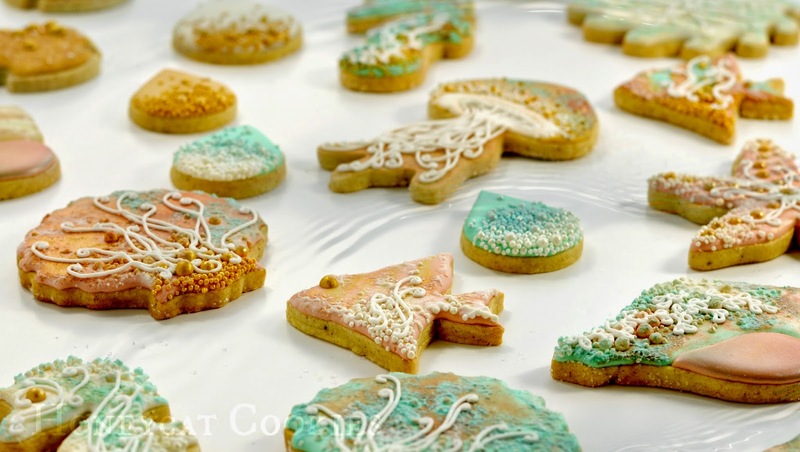 Or you can repeat the same process in different colours on ALL THE COOKIES! I used white, pink, and beige icing with gold and pearl lustres and basically had better fun than if I'd been on a beach with a bucket and spade. 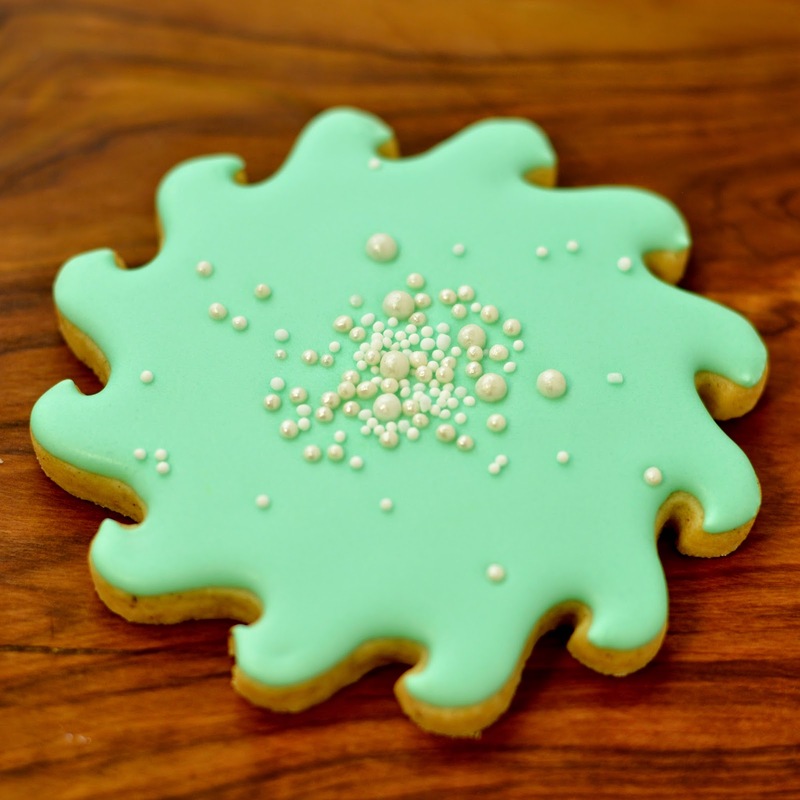 Who cares if none of the cookies were actually metallic objects? 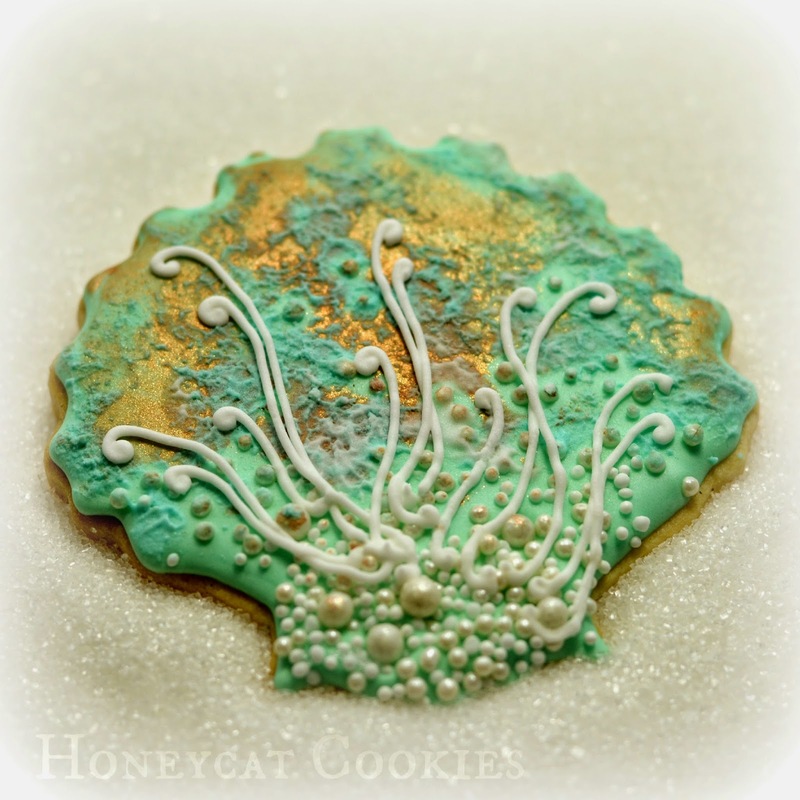 In the Honeycat Ocean seahorses and shells are made of copper so of course they're going to be covered in verdigris. 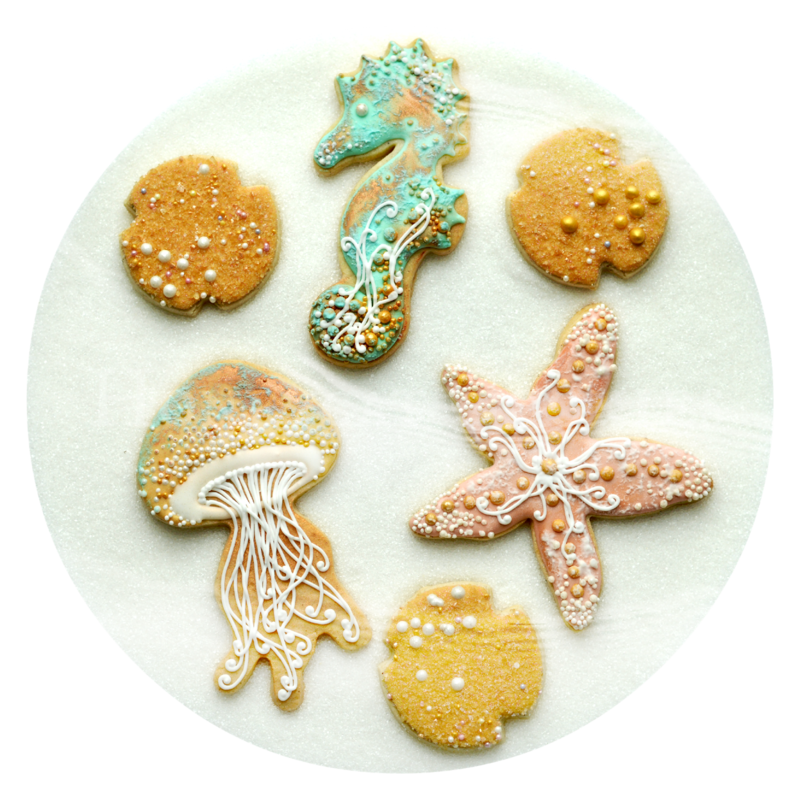 I made the sand cookies (you can see them more clearly in the round photograph near the top) by cutting little notches out of small circles, to get a vague kind of sand dollar shape, then flooded with thick beige flood and liberally sprinkling with edible sand. 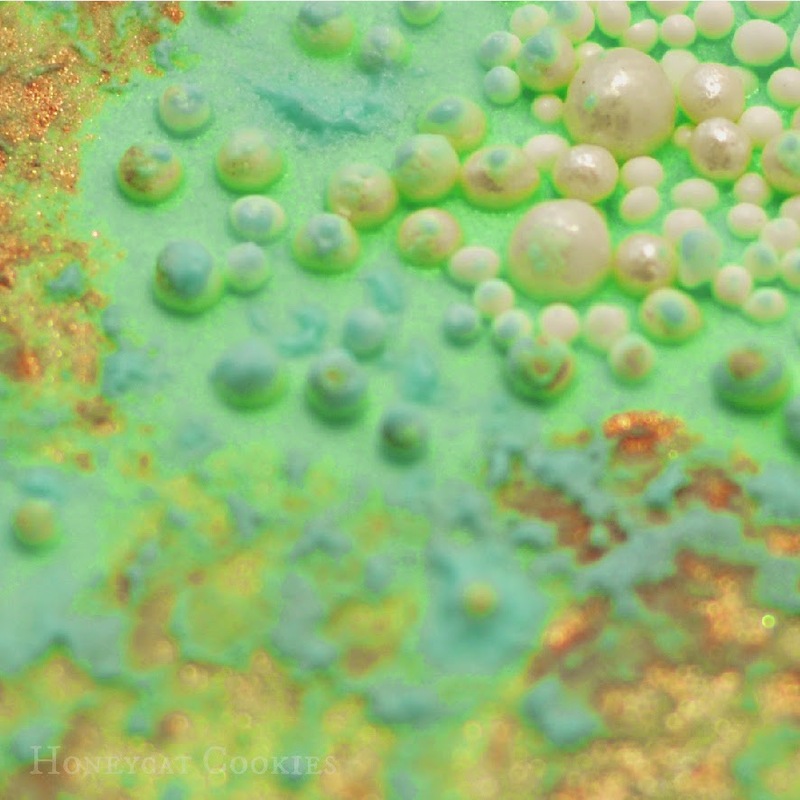 After seeing this mini tutorial by Cookies by Missy Sue on natural looking sand, I made my own, using fine and coarse brown and white sugar, a little lustre dust and some cream and multi-coloured tiny sugar pearls.